My Dad drove a General’s Jeep in WWII, third wave Normandy. Thanks Pop. And thanks to all our Vets. My bride Brenda and I were married on Veterans Day 41 years ago. Thank you Brenda. Thank you for this wonderful life. 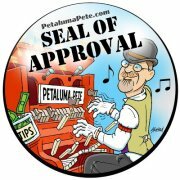 Click HERE to see Petaluma Pete & son Jack playing God Bless America.